Teacher/staff and parent surveys that capture their perceptions and experiences. Interactive reports with survey data visualizations. Early Education Essentials consists of six essential organizational conditions. 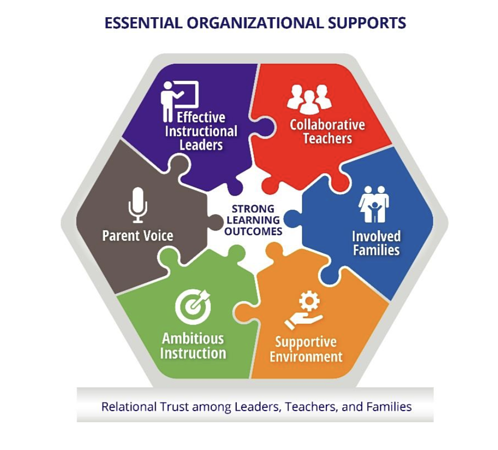 Five align with the K-12 5Essentials framework created by the UChicago Consortium, and the sixth is a new essential which captures parents’ unique perspective - Parent Voice (see image 1). Early Education Essentials evolved from the five essentials framework and K-12 5Essentials surveys, building off decades of research by the UChicago Consortium, and demonstrating that schools strong in at least three of the five essentials are 10x more likely to substantially improve student engagement and achievement in reading and math (see graph 1). Ounce researchers adapted the teacher survey and created a new parent survey for early childhood education settings. 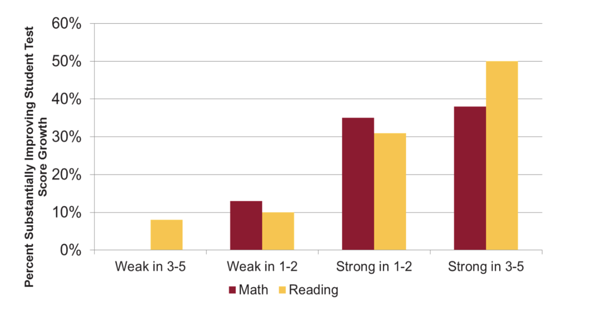 A recent validation study confirmed that scores on the Early Education Essentials surveys are directly related to the quality of teacher-child interactions (as measured by the CLASS-PreK) and children’s attendance outcomes (see graph 2 & 3). In addition, researchers spent time observing and talking with leaders, teachers, and families in early childhood education programs whose survey responses indicated that their essentials were either very strong or very weak. They found that differences in organizational climate and conditions were stark and unmistakable. 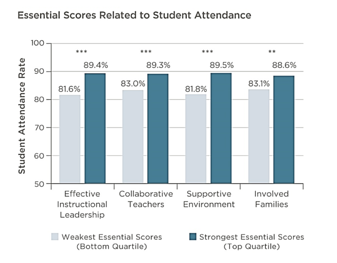 A recent report described strong organizational environments and how they empower leaders, teachers, and families to aspire to and realize higher-quality practices and better outcomes for young children. Attendees of this year’s Teachstone InterAct CLASS Summit will have the opportunity to learn more about Early Education Essentials at the following session: The Early Education Essentials: Using Teacher and Parent Survey Data to Strengthen Organizational Climate and Conditions Essential to Improvement. Session attendees will learn how the measurement system can be used in combination with the CLASS to strengthen quality in early childhood education programs. They will hear success stories from the growing number of programs across the country who are currently using the Early Education Essentials to guide improvement. Can’t wait until the Summit to learn more? Check out theounce.org/eee or see the Early Education Essentials in action in a recent case study.